Towards the end of the last year of the last millennium (1999), Hot Wheels slipped in four Ferrari castings: Ferrari 456M, Ferrari F50 (hardtop), and the Ferrari F355 in both the Challenge and Spider trim levels. Had this happened in 2015, it would have been a much bigger deal given the fact that Mattel lost the Ferrari license at the end of 2014. Also, there is a larger base of Ferrari Hot Wheels collectors now compared to back then — or at least, we (in the U.S.) have been exposed to a larger pool of collectors given the impact social media has had. The Hot Wheels Ferrari F355 Challenge stood out compared to the other three Ferraris as they were the traditionally Ferrari Red while this one (shown below) featured an authentic race-inspired design. Hot Wheels even released this one in the Hot Wheels Collectibles 1:18 scale line — in fact, all four of these “New Models” were released in 1:18 scale leading me to believe they were initially for that line and were scaled down to 1:64 scale after the fact. 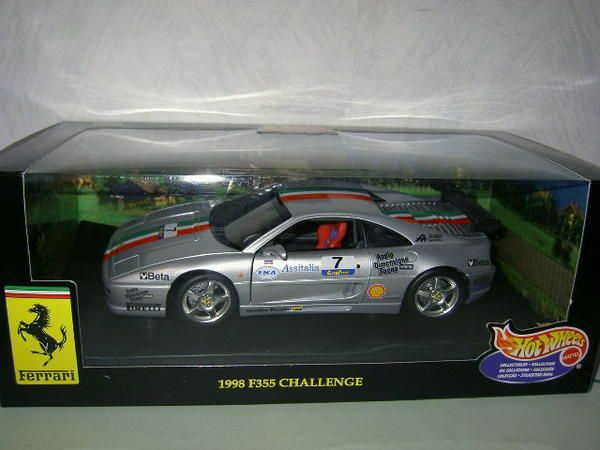 The Ferrari F355 Challenge had several releases in the mainline, Ferrari Racer line, and various Ferrari 5-packs until it joined the ranks of our #Discontinued Castings in 2010 (after its final release as part of the “Ferrari 5” 5-Pack for that year). Several of the releases of this casting are extremely hard to find, so completing a collection of this casting could prove to be very difficult. While the “First Edition” of this casting is plentiful (shown below), a rare #5-Dot Wheel Variation could bring you upwards of $100 (mint in package). RELEASE DETAILS: Silver Body (metal). Dark-Tinted Windows. Black Interior. Dark-Tinted Wing. Chrome 5-Spoke (5SP) Wheels. Unpainted Metal Base. Made in Malaysia. Toy# 23903. Released in 1999 as part of the 1999 basic car mainline, collector #1115.